If you need some inspiration for your ‘to-bake' list, you're in luck today my friend! 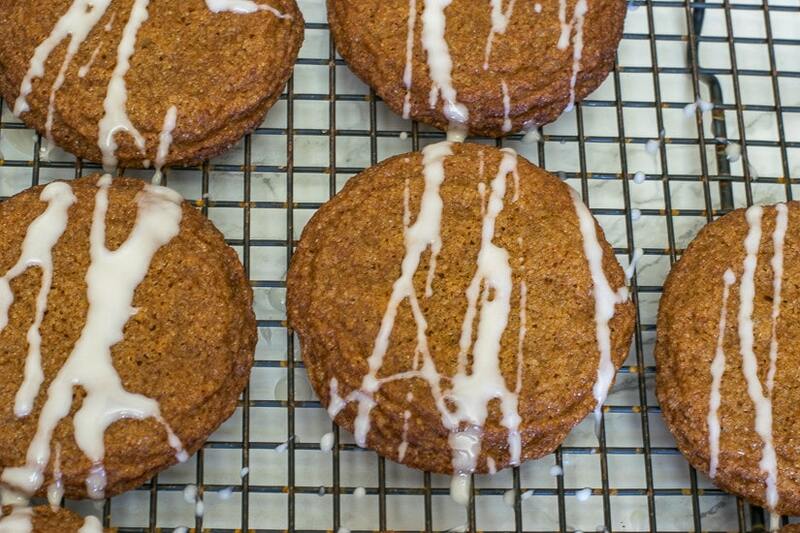 I'm sharing this recipe for Glazed Crisp Ginger Molasses Cookies. Are you making your list and checking it twice? I'm not talking about your list for Santa, but the list of all the cookies and sweets you'll be baking this year for Christmas. I don't know about your home, but in my home, the discussion about which cookies make THE list can be quite contentious. 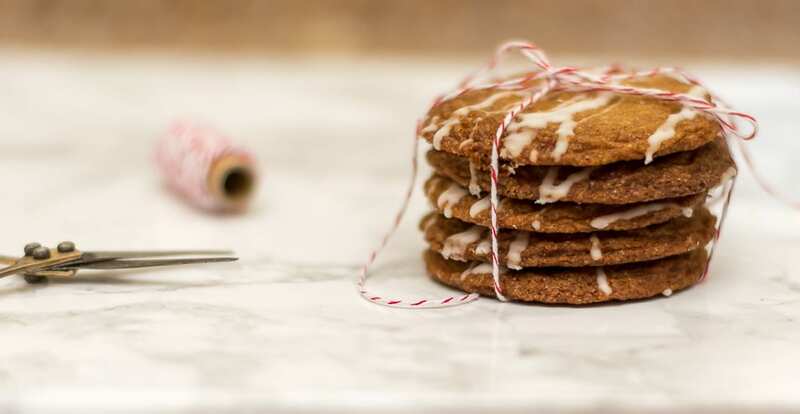 These glazed Ginger Molasses Cookies are the perfect combinations of crisp and spicy and are typically my mom's contribution to the cookies we consume on Christmas Eve, after church and dinner, while we continue the tradition of watching “A Christmas Story”. You know, the movie in which Ralphie wants a Red Rider BB Gun for Christmas and his dad wins a leg lamp. If you haven't watched it, you should…it's a delightful movie that my family enjoys year after year. My mom found this recipe on Martha Stewart's website and has been making it ever since. And since I'm not one to recreate the wheel, I'm including Martha's recipe. My only ‘change' to the recipe is the very simple glaze that I drizzle over the cookies when they are cool. Preheat oven to 350 degrees. Whisk flour, ground ginger, baking soda, and salt. Beat butter and granulated sugar with an electric mixer on medium-high speed until pale and fluffy. Beat in egg and egg yolk, then the grated and crystallized gingers. Reduce speed to low. Add flour mixture in 3 additions, alternating with the molasses. Beat until well combined. Shape teaspoons of dough into balls, and roll in sanding sugar. Space 2 inches apart on parchment-lined baking sheets. Bake until cookies are flattened and edges are dark golden brown, 12 to 14 minutes. Let cool on sheets 5 minutes, then transfer cookies to wire racks to cool completely. When cookies are completely cool, drizzle with glaze. Cookies can be stored in airtight containers for up to 2 days or frozen for up to 1 month. Mix ingredients. If it's too thick add milk in 1/8 teaspoon milk until the consistency of thick cream. My mom also notes that these ‘freeze well', but…we've never gotten around to freezing them. I mean…who does that anyway? Have you started thinking about your Holiday and Christmas baking list? What will be on your list? I'm always in the market for some new recipes! Pin it to return to this recipe! Your ginger molasses cookies look amazing and I can’t wait to try this yummy recipe!!! Thank you for sharing! Beautiful pictures by the way!!! Hey Tammy, they really are tasty morsels! They disappear quite quickly in our home. I hope you enjoy them and thanks for the compliment. My husband is all about anything ginger around the holidays, so I think he would love these! They look awesome! I pinned these to my board yummy food! Thanks for sharing this recipe! Yum! I love ginger cookies! These look delicious! They will definitely be on my “must bake” list this year! These look so pretty, and the recipe sounds delicious. I’m glad you mentioned the movie. I had forgotten how funny it is. We will watch it soon because my son loves comedies. Hi Sherry, your son will love the movie…my son does…well we all do! And I hope you enjoy the cookies…they are so delicious. Your photos are always so beautiful Lynn! These cookies sound and look like they’d be a hit over here, cause we love ginger! I definitely want to put them on my list! I can smell the ginger all the way over here, I swear! yum! I love ginger cookies and have some candied ginger root that I have been saving for just such an occasion. They don’t have chocolate so they can’t be the favorite Christmas cookie for the rest of the family, but they certainly can be for me! Thanks to you and ‘Mom’ for finding the recipe – I can’t wait to try it. Hi Penny…oh, you must make those cookies! They are so fantastic. I have my ingredients but haven’t found the time to bake them yet. I do need to do it soon though!